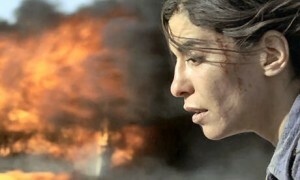 This Wednesday at 7.30 pm in the Arts Centre, Newry Film Club presents their latest offering, the highly-acclaimed film Incendies. A mother’s last wish sends twins Jeanne and Simon on a journey to the Middle East in search of their tangled roots. The film tells the powerful and moving story of two young adults’ voyage to the core of deep-rooted hatred, never-ending wars … but also enduring love. It was adapted from the play of Wajdi Mouawad, of the same name.